We can’t know this for sure, but the Callaway Epic Irons appear to be Callaway’s response to PXG’s luxury line of products. If you’re not familiar with PXG, they’re a relatively new company that makes incredibly expensive golf clubs. Callaway spared no expense when developing the Callaway Epic irons and combined the features of many of their best golf clubs into one product. 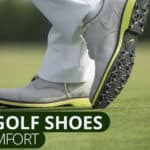 Previously, major golf club manufacturers avoided jampacking one golf club full of the best golf club technology because of cost. There simply wasn’t a market to justify the investment. However, it appears that these days, Callaway and some other golf club manufactures have changed their minds. Enter the Callaway Epic Irons. The Callaway Epic golf clubs give you long distance, tons of forgiveness, and the ability to shape shots – all in one golf club. 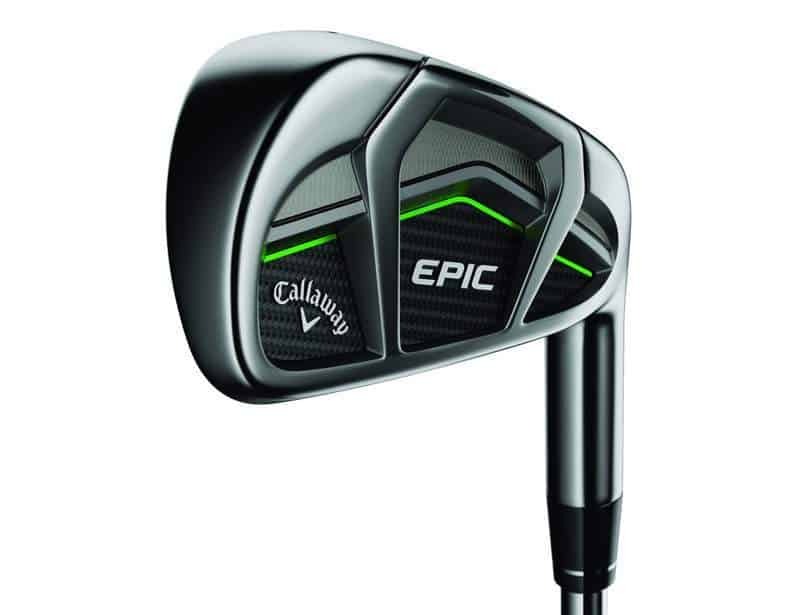 To state the obvious, the design of the Callaway Epic incorporates the best elements of Callaway’s best golf clubs for players of all skill types. 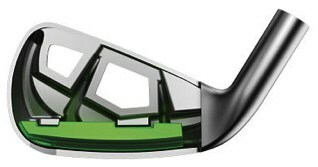 Similar to the new Callaway Rogue irons, the Callaway Epic irons feature 360 face cup technology. 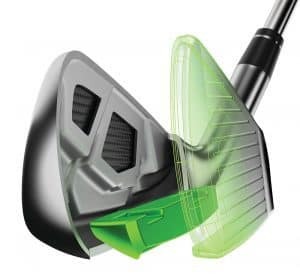 Face cup technology is a Callaway innovation designed to increase ball speed on their best golf clubs. Face cup technology makes the face of the clubhead extremely thin (1mm at its thinnest point) to increase flex and rebound on the clubface. As you might imagine, this typically keeps Callaway’s best golf clubs in the running for the best golf clubs for distance. 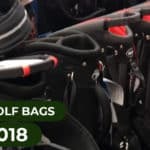 Callaway’s Ex0-cage construction is not new to the company. 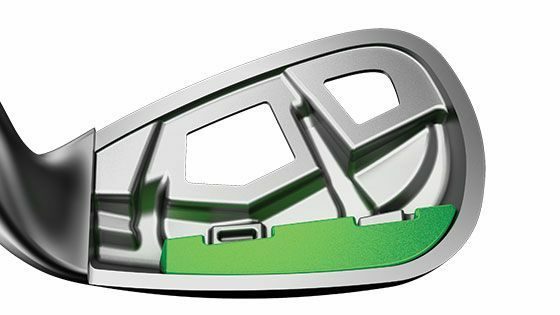 They implemented this technology into one of their best golf clubs last year (Big Bertha OS irons). Exo-cage construction is a bit complicated, but essentially, it’s designed to make the face of the golf club take on more of the load of impact. This is known as “energy lensing” and improves the amount of energy transferred from the golf club to the golf ball at impact. Efficiently transferring energy to the face of the golf club through impact creates more ball speed via a more efficient energy transfer. In nerd speak, the Ex0-cage construction has improved the coefficient of restitution (COR) of the golf club. In doing so, exo-cage reduces the amount of kinetic energy wasted when the golf club collides with the golf ball. All you really need to know is that this makes the ball go faster and farther. Most of Callaway’s best golf clubs feature perimeter weighting. The Callaway Epic Irons are no exception and also feature perimeter tungsten weighting. This feature places more weight at the bottom of the golf club and away from the clubface. Each golf club has a different weighting system to match its individual club length and clubhead size and weight. The point of the tungsten perimeter weighting is to improve each golf club’s center of gravity for more consistent ball striking and flight. 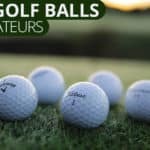 The lower a golf clubhead’s CG, the higher the ball will fly. In addition to the tungsten perimeter weighting, Callaway has hollowed out the hosel of these golf clubs and redistributed the weight to the clubhead. In total Callaway removed 20 grams from the hosel. This move is specifically designed to increase the stability of the golf club. 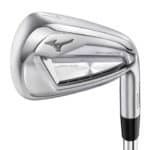 Similar to many Mizuno products, the Callaway Epic irons offer premium shaft upgrades at no extra cost. In a golf club, the shaft is like the engine of the iron. A bad shaft will produce bad results no matter how fancy the clubhead. With the Callaway Epic irons, Callaway spared no expense and allows you to choose among a few premium shaft options. 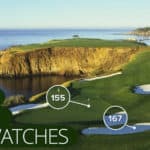 Although they market this as “no additional cost,” these clubs cost over $1500, so in our opinion, its the least they can do. Callaway really worked on the style of these “game improvement” irons. The best golf clubs out there look great from address and inspire confidence. 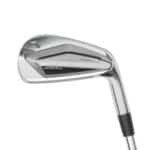 A major criticism of game improvement irons is that they look clunky and awkward at address. However, this awkward look is due to the technology in the clubhead that makes it easier to hit. If you take it away, you have more of a forged iron with no offset and you lose forgiveness. Callaway took this issue on with the Callaway Epics. Although we still think they have that game improvement “look,” they do improve upon previous designs. As we indicated, you can’t take away the game improvement look completely without sacrificing forgiveness. For those of you who want to explore Callaway’s luxury Epic Irons, but don’t want to play a “game improvement iron,” Callaway also offers the Callaway Epic Pro Irons. 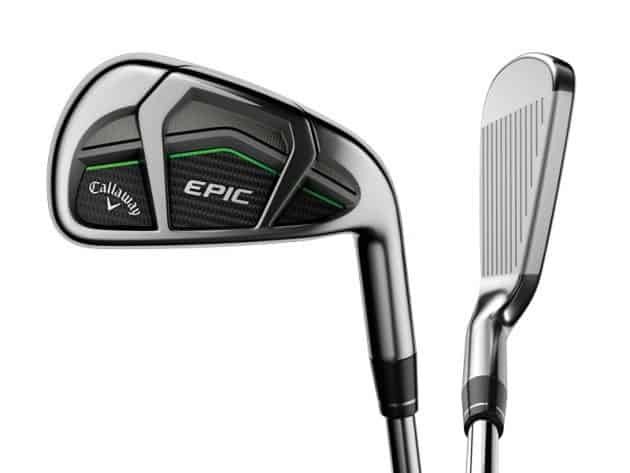 These golf clubs offer the same benefits of the Callaway Epic, but with slightly smaller clubheads and more of a forged iron look with less offset. Check out the Callaway Epic Pro Irons. The Callaway Epic irons are just that, epic. They really went down the engineering rabbit hole on these ones. By placing an unlimited budget on their design, Callaway took the features of these golf clubs to the next level. By all marks they seem to improve on previous designs. If you couldn’t tell by our review, these are meant for distance, distance, distance. Almost all of the engineering moves improve distance in one way or another. Aside from distance, what we’re impressed by is the ability to work the ball with these clubs. A If you’re a high to mid-level handicap these are some of the best golf clubs out there. However, we’d be remiss if we didn’t address the cost. These things are expensive. Callaway is tapping into the luxury golf club market for sure. If you’re in the market for big distance and playability and you have a big budget, these are the best golf clubs for you.